Membership of the Friends of the 502 Group will give you the opportunity to take part in all Group activities. In addition to receiving our newsletter and an invite to our private internet discussion forum, you will be able to visit the 502 as part of a work party to help out with restoration work. However there is absolutely no obligation to take part in ‘hands on’ work. Joining is an excellent way to stay up to date with the very latest news from the 502 project. Anyone paying just £36 (or £3 per month by standing order) is automatically enrolled into the group for a year, but you are welcome to add a further donation, large or small. Membership of the Friends of the 502 Group runs from May to April each year, with renewal due on 1st May. If you don't want to commit to the group as a member at this time, you can still contribute to the group's funds. Visit the donate page for more information. Simply complete a membership form and return it to us with a cheque or postal order for your subscription fee. 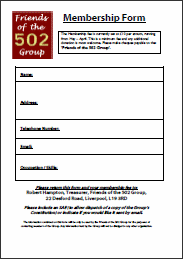 Cheques should be made payable to Friends of the 502 Group. The address is given in the form. Cheques must be in pounds sterling from a UK bank account. We can accept payment by monthly standing order direct from any UK bank. 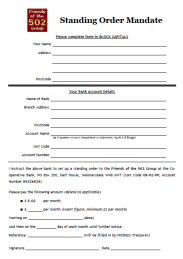 Print out and fill in the standing order mandate and return it along with the membership form above. If you are an existing member who wishes to set up a standing order, please contact the treasurer for details. If you already have a standing order with us and wish to amend it, please contact your bank directly and then notify the treasurer of the changes. It is now possible to donate to the group by PayPal using a credit or debit card, or using the funds from a PayPal account, if you have one. The minimum payment to join the Friends of the 502 Group is £36. You are welcome to add any further donation on top of this. Click the Donate button below to be taken to the PayPal web site to carry out your transaction securely. You will be returned to our site when you are finished. The PayPal page has an “Additional Information” box. You may use this to enter details of your occupation or skills you possess, if you believe they will be useful to the group. If you are an existing member, please also provide your membership number, if known. Unless otherwise stated, text and images on this site are Copyright.